Once upon a time, back when most files were saved on floppy disk, Microsoft wished to speed up the process of saving documents in Word. Users didn't want to wait for such slow devices to write a file to disk. So Microsoft used the technique of appending only the changes to the file, so that instead of 50Kbytes, perhaps only an additional 1 or 2KBytes needed to be saved. This improved the Save time dramatically. A problem emerged: Word files, being horrendously complex already, became more so and tend to corrupt much more often with fast saves enabled. It also becomes impossible to recover - since changes are scattered hither and yon. Also, in order to keep track of what was changed, great amounts of information have to be stored with the changes, creating hugely bloated files. This is especially true where graphics exist in the file. That 50K file may baloon to 1MB or more. 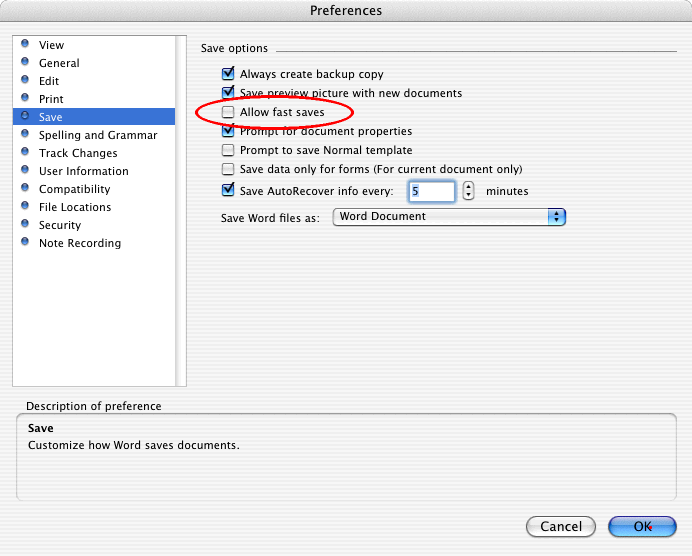 Fast saves tries to get around these problems by performing a fresh write of the whole file every 10 times the file is saved, but if the file becomes corrupted, this won't always fix it. Nowadays, there's an additional consideration: Modern hard disk drives are fast, and they or the operating system typically have memory caches so that saving even a relatively large file to a hard disk takes almost no time at all. Opening a file for appending, determining the end of the valid information, and then appending just the changes may in fact take longer than writing the complete file. This information is also posted at the Mac MVP site.